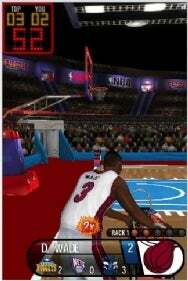 Freeverse Software on Tuesday announced the release of Flick NBA Basketball for the iPhone and iPod touch. It’s available from the App Store for $5. Flick NBA Basketball — the newest in Freeverse’s Flick Sports game series for the iPhone — features five individual events starring real NBA players, one from each of the league’s 30 teams: everyone from the Boston Celtics’ Kevin Garnett to the Cleveland Cavaliers’ LeBron James, Kobe Bryant, Shaquille O’Neal, Yao Ming and many others. The five events include Three Point Shootout, Hotshot Arcade, Long Shot Challenge, H.O.R.S.E. and a “Ball Spin” mini-game in which you swipe and keep the ball going while tilting to maintain balance. Flick NBA Basketball requires iPhone 2.2.1 software update.